Get all the benefits from this 30 hours of basic Ayurveda certification course in Ecuador! This course is designed to implement what you learn in short format that can benefit any and all holistic health practitioner or registered massage therapists who want to expand their present practice by implementing simple Ayurveda modalities learned here within, it also provides CEU; continued education units which every holistic practitioner is required to keep upgrading each year, learn personalized holistic nutritional education for all interested individuals, be a novice for purpose of self-help or an add-on to your existing practices, it is sure to generate interest in taking on deeper studies in the field of Ayurveda and yoga modalities to become professional practitioners. 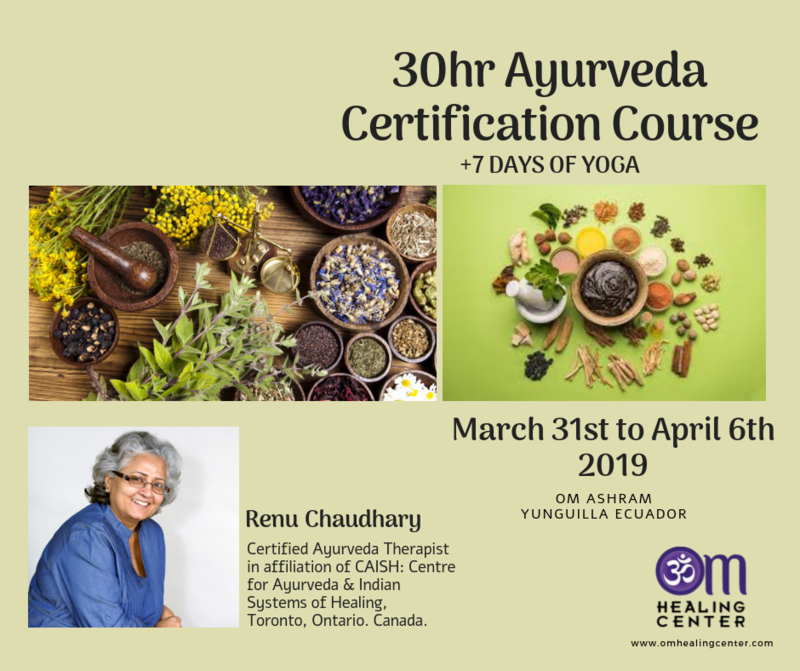 A 30 HRS CERTIFATE OF COMPLETION will be given to all participants by CAISH: Center for Ayurveda and Indian Systems of Healing, Toronto, Ontario, Canada. 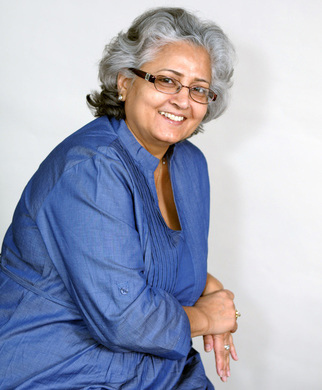 Course Coordinator Renu Chaudhary; Certified Ayurveda Therapist is in affiliation of CAISH: Centre for Ayurveda & Indian Systems of Healing, Toronto, Ontario. Canada. 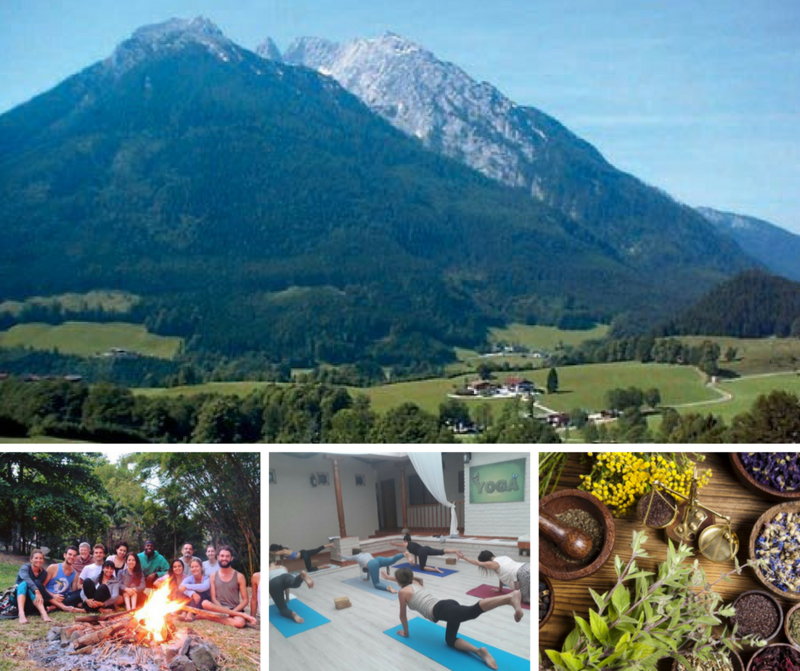 Renu invites you to share her passion and to guide you in this incredible journey where you will learn the transformational power of this ancient science. Let this ancient medicine connect you to your wisdom so you can tap to your divine self. 8:00 – 9:00 pm Practicum: Golden Latte Group session in Kitchen! 9:00 a.m. Closing CIRCLE WITH; Gayathri Mantra Chanting and handing of certificates. Renu Chaudhary is the author of Ayurveda to the Rescue: An Ancient Remedy for Modern Ailments. She teaches and practices Ayurveda with a specialty in Ayurvedic nutrition. Renu holds a Bachelor of Sciences degree, and is a Certified Ayurvedic Practitioner CAP, a Registered Naturotherapy Practitioner RNP, as well as a Certified Cupping Therapist CCT. Maria Elena Calderon is the founder and owner of OM Healing Center in Cuenca, Ecuador. She fell in love with Hatha Yoga in the year 2000. She started with gentle Hatha Yoga to help her deal with stress and anxiety. Her frequent practice helped her find harmony in her life. She became more aware of her posture, alignment, body movement and most importantly, her levels of stress and anxiety had diminished. To become an instructor became her next logical step – she decided to complete her 200 RYT teachers training in India. She now lives in Ecuador where she teaches bilingual Hatha Yoga classes. 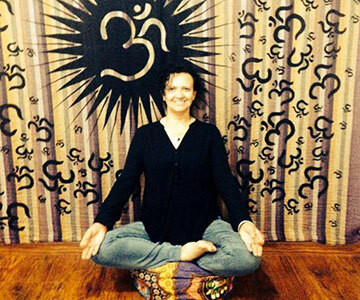 To share her passion, she is now a registered Lead Teacher with Yoga Alliance and has registered OM Healing as a Yoga Teacher’s Training School for the 200-hour program.